Black & Mild Plastic Tip Casino's are filled with combinations of Middleton's famous dark pipe tobaccos. 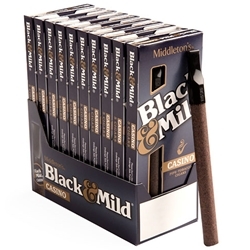 Each Black & Mild Casino blend delivers an exquisite and luxurious smoking experience for all pipe tobacco and cigar smokers. Try them out today here at Smokers Discounts!